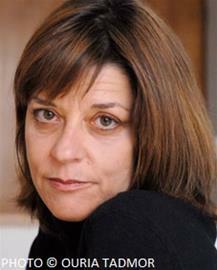 Writer and columnist Gail Hareven was born in Jerusalem in 1959. She studied behavioral sciences at Ben-Gurion University of the Negev and Talmud and Jewish philosophy at the Shalom Hartman Institute. Hareven has written widely on politics and feminist issues; she has been a columnist for Maariv, Hadashot, the Jerusalem Report and Lady Globes; she also writes book reviews for the Hebrew press. In addition, Hareven teaches feminist theory, gives writing workshops and lectures on a variety of socio-cultural topics. In 2006, she was visiting professor at the University of Illinois. Hareven has published eight novels, four collections of short stories, two non-fiction books, two children's books and four plays, all of which have been staged. For her novel, The Confessions of Noa Weber (My True Love), Hareven received the prestigious Sapir Prize (2002) and the Best Translated Novel Award (USA, 2010). In 2013 she was awarded the Prime Minister's Prize.